Wargaming recently announced the MKA was entering Supertest stage in World of Tanks, but what is this mysterious tank? 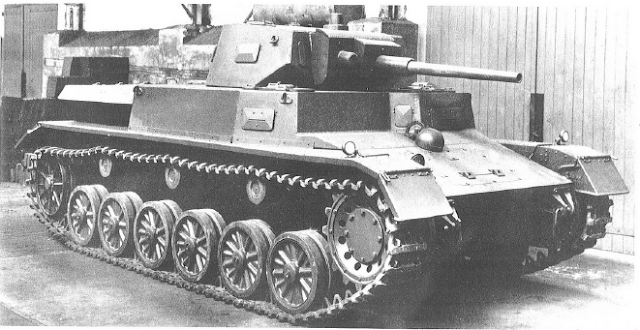 The MKA can be best described as a curious crossover between an early Panzer III and Panzer IV, designed to be exported overseas, only one prototype was built before the project was cancelled. The origin of the Mittlerer Kampfwagen fuer Ausland (MKA) can be traced all the way back to 1935, Krupp and Daimler-Benz were competing for a production contract that would become the Panzer III. The Daimler-Benz’s design proved to be more favourable, Panzer III Ausf. A, but Krupp still felt their design was worthy and it would become the MKA. The MKA is part of three similar projects, the Leichter Kampfwagen fuer Ausland (LKA), Light Tank for Overseas, and the Schwere Kampfwagen fuer Ausland (SKA), Heavy Tank for Overseas. The LKA project was based off the Panzer I, while the SKA would be an up-gunned version the MKA. The export program itself came about as a desire to sell tanks overseas, mainly inspired by what France was doing with the Renault R35. Germany was looking for a tank that would outperform any tank that was being exported, but at the same time, they didn’t want to sell their latest tank technology. Because of this, the LKA, MKA and SKA were to be simplified versions of pre-existing vehicles and designs. The same chassis for both Kampfwagen. If demanded, a 90 horsepower water-cooled Ford V8 engine is planned. The same chassis for both Kampfwagen. If demanded, a Maybach water-cooled engine is planned. This change merged the 4,5 cm KA (m.KA) and the 4,5 cm KAv into one vehicle, the 4,5 cm KAv (MKA) and was to be given the 200 hp Maybach HL 76 engine, still in development at the time. 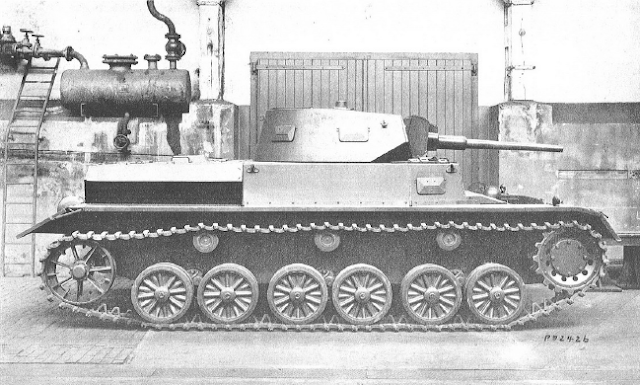 In June of 1937, the question was brought up as to whether or not Krupp’s MKA was to be released for export at all, or if it would be used by the German army. However, this decision would need to wait to see if the HL 76 engine would be completed in time. But by October 1937, the engine was still not available and Krupp was advised to use a 155 HP Maybach D.S.O.8 Motor instead, which worked well in various towing vehicles. It wasn’t until the end of October, that Krupp completed the drawings to develop the 4.5 cm Kanone L/50 specifically for the MKA, with a weight of 1,385 kilograms, it could fire a shell at 750 m/s and penetrate up to 40 mm of armour at 1,000 meters. A turret was later designed in March 1938 and produced by August 1st of the same year. The project was taking a long time to move and on October the current MKA chassis was rejected. The reason was its armour was too thin and the engine compartment and cooling system were too current, meaning this would need to be simplified so that Germany wouldn’t be selling its latest technology. The requested changes were made and the only trial vehicle was assembled in January 1940. It featured 25 mm of frontal armour and a temporary Maybach HL 98 engine, rated at 230 HP, that would later be replaced by the HL 76 once it was complete. Unfortunately, by the time the prototype was complete, World War II had well underway, the program was cancelled and the vehicle was scrapped. While the LKA would see limited success with small numbers sold to Spain and China before 1939, the SKA was cancelled in 1937 because it was too expensive and the MKA only saw the one prototype build. With the increasing war the search for new foreign partners, that could potentially buy the MKA, turned increasingly difficult if not impossible. New Panzer III models also surpassed the MKA in every aspect, so there was no reason to introduce the outdated MKA to the German army either. Nonetheless, the MKA was an important step in German tank production, the 4.5 cm Kanone L/50 might have served as an inspiration for the KwK 38 and KwK 39 and its suspension and hull would undoubtedly lay the groundwork for Krupp’s development of the Panzer IV. The MKA will be introduced as a Tier II, Premium light tank in World of Tanks, the class change in the game is most probably for game balance, but it could fit well as a medium tank instead. A bit sad that it is not kept as a medium tank – armor isn’t that much of an issue on this tier, see Britisch Medium I & II, but a premium medium tank on tier 2 would be nice. As a light tank it might be more misleading due to its slow speed for example. Plus, it would (most likely) have the same five person crew layout as all the Pz IIIs and IVs (unlike the S35 739). Crew as made of four members in the MKA. Any idea on blueprints of the SKA? I couldn’t find any, but it could have been a “paper project” that never actually passed from the specification stage, as it looks it was cancelled straight away. Also, from what I read, it could be an MKA but with more armour. Same crew roles as in Luchs and Leopard 1?